Metro Rail News, Dhaka: Bangladesh will get its first underground Metro railway by 2026, with the construction work starting in July 2019. Funds for the Bangladesh Metro project is coming from Japan. As estimated to carry 1. 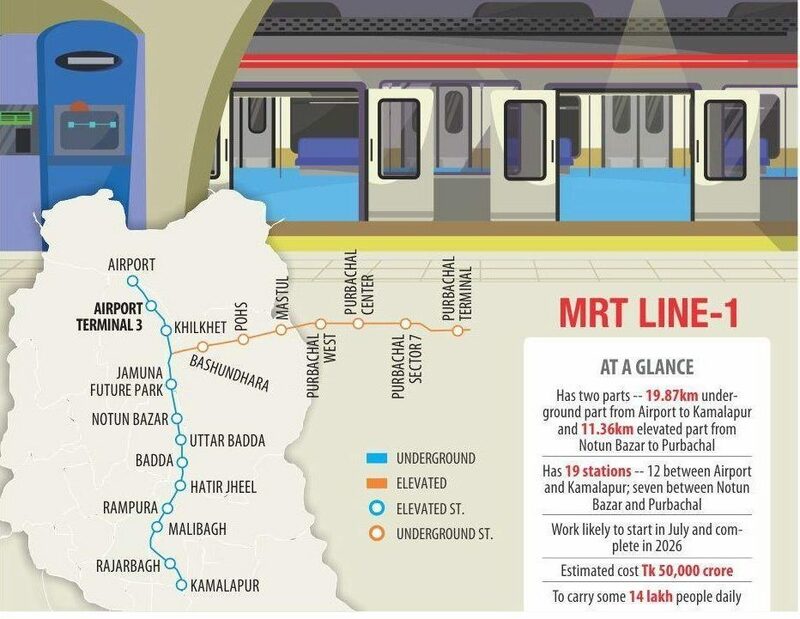 4 lakh people per day, the 31.24-km MRT Line-1 connecting capital Dhaka’s airport and Kamalapur will also have an elevated part between Purbachal with Notun Bazar, The Daily Star reported. Quoting an Economic Relations Division (ERD) official, the report said the estimated project cost was Tk 50,000 crore but the actual amount would be known once the design was finalised. The final agreement on the amount of loan Japan will extend is expected in June. The Dhaka Mass Transit Company Ltd will be implementing the project. “We will begin the construction in July and people will be able to use the service by 2026,” MAN Siddique, managing director of Dhaka Mass Transit Company Ltd, told The Daily Star. The country is currently constructing a 20.1-km elevated Metro rail (MRT Line-6) between Uttara and Motijheel in Dhaka. Japan is funding this project too, and the line will be ready by 2020. The Bangladesh government plans to build one elevated, one underground, and three underground plus elevated Metro lines in Dhaka and its adjoining areas by 2030, according to the news report. The plan aims to ease traffic and reduce pollution.